Is Your Vehicle a Marketing Vehicle? 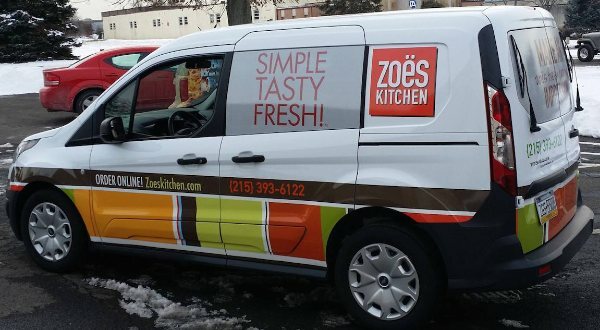 If you are a contractor on your way to the jobsite or a restaurant like our client, Zoe’s Kitchen (who just had their delivery car wrapped last week! ), put your car, truck or van to work for you while it’s already out on the road. Even while sitting in your driveway, vehicle wraps make a statement about who you are and what you do. They are one of the most effective and affordable advertising strategies today! With this high impact investment, your business will attract more attention and more customers! Apple Graphics is the most trusted provider of high quality vehicle wraps in the Philadelphia area. Be sure to follow us on Facebook to stay up to date on all of our latest projects!